Good morning, friends! I’m so sorry for the delay in getting today’s post up. As you may have seen on Instagram, I hopped on a plane last night to visit the cowboy in Wyoming! Unfortunately, that “hopping” took wayyy longer than expected. A few delays on the tarmac and a completely re-routed flight later, I finally made it! And promptly crashed before getting this post together. In my opinion, though, today’s post makes up for it! 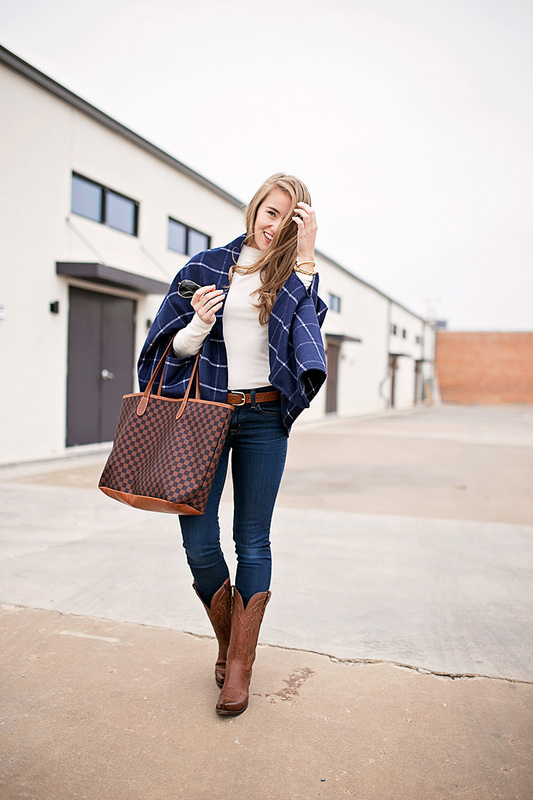 This plaid wrap from Tuckernuck has had me swooning ever since it arrived in the mail. I love the design… there are two small slits for your arms that allow this wrap to lay in the most elegant way. 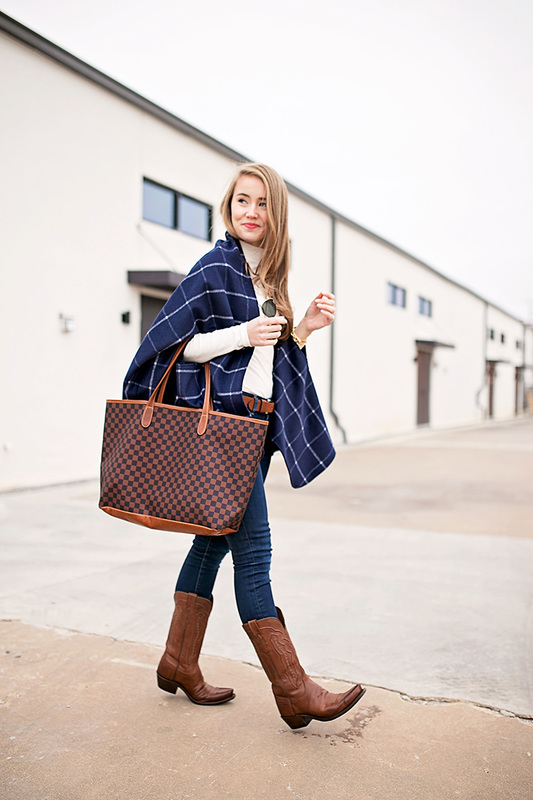 Add a classic navy and white check, and you’ve got the perfect piece for these chilly months ahead! 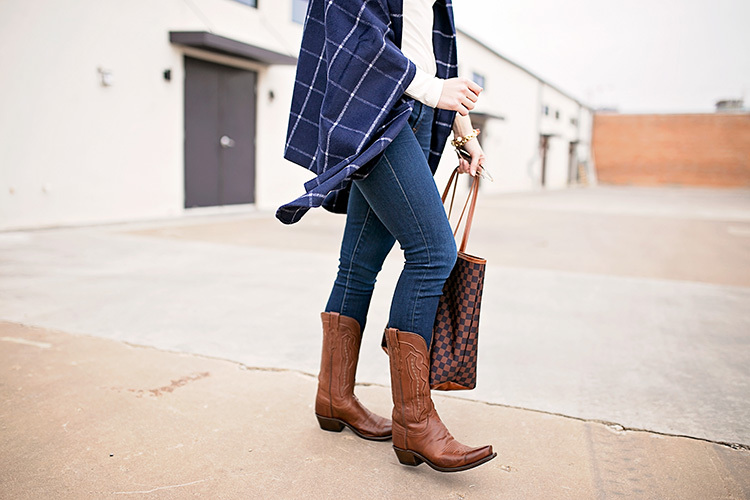 Instead of pairing it with booties or riding boots (both of which would look darling) I decided to put a little Texas spin on the look with these beautiful Lucchese cowboy boots! The quality and beauty in each boot crafted by Lucchese is nothing short of amazing. These are shoes I will have for years and years to come. Wishing everyone a lovely start to the week! We stopped in Denver last night before making the drive to Cheyenne today. I got to stay with one of my best friends since high school, Camille, which is enough to fill my happy tank for a while! While we were catching up this morning, I looked out the window to see SNOW! It’s stunning! Can’t wait to show y’all more on Instagram. Be sure to follow here! Love that wrap! Hope you have a great trip! That’s a really gorgeous outfit! I love the wrap a lot! So cute with the turtleneck! Have so much fun in Wyoming! Love the wrap! Glad you got there safe and sound! Enjoy your time! Oh I love this! Especially with the western touch. 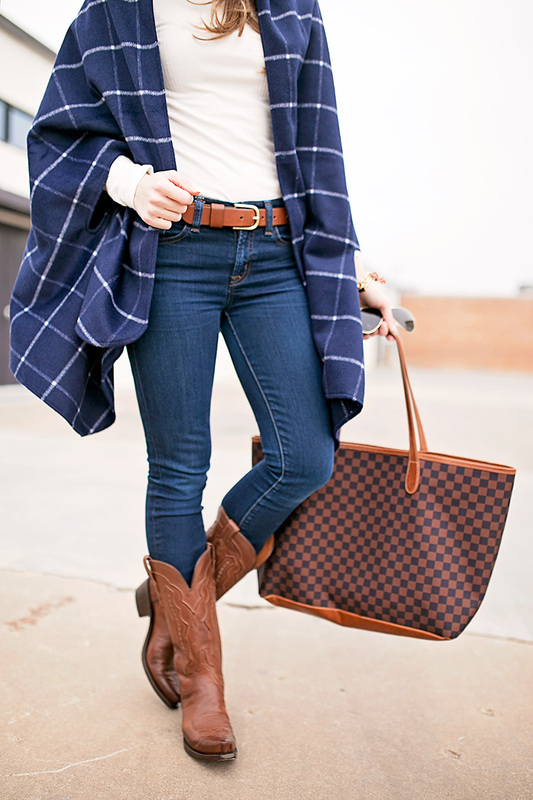 Who doesn’t love a good pair of cowboy boots?! this is darling! you’re really making me want to get a pair of cowboy boots (despite the fact that I live nowhere near anything southern)! I love the wrap, it makes the whole outfit look so cozy! Flight changes are the worst! Glad you made it safe. Love this outfit! Obsessed with this outfit! Love your plaid warp, so so cute! Good ‘ I should definitely pronounce, impressed with your website. I had no trouble navigating through all tabs as well as related information ended up being truly easy to do to access. I recently found what I hoped for before you know it in the least. Reasonably unusual. Is likely to appreciate it for those who add forums or something, website theme . a tones way for your customer to communicate. Excellent task..